An email from Wara artist, Akira Moriya on the English title for the first Japanese publication on Wara Art caused a chuckle. “Reinvigorating a community with straw” seems an unlikely title for either a publication or a project. Could there be a correlation between how Wara Art is impacting on the West Australian Wheatbelt town of York and what is happening in rural communities in Japan? 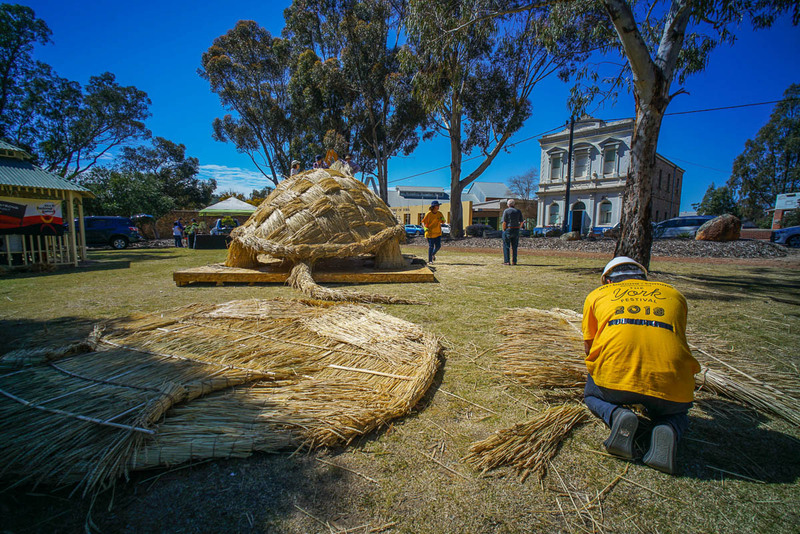 In 2016, The York Festival was looking to connect York’s Wheatbelt identity with the visual arts and hit upon a sculpture prize that invited artists to make a sculpture using a single small bale of hay. 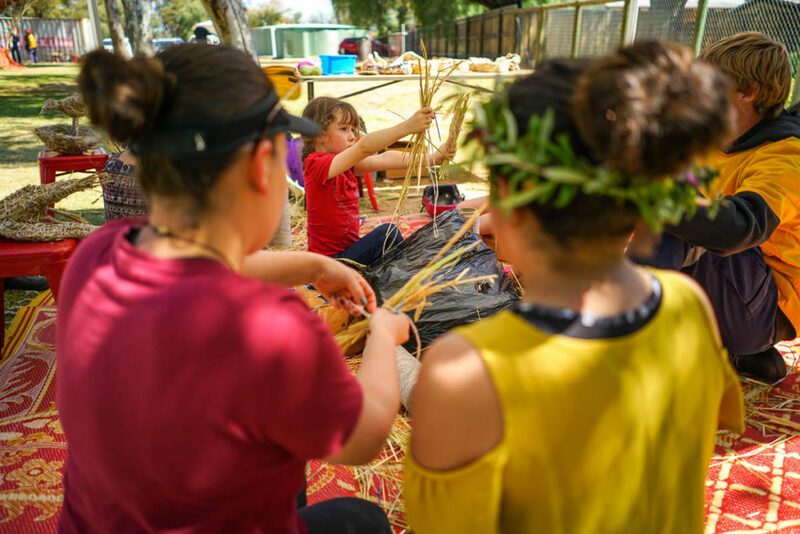 With input from Noongar artist Sharyn Egan, the Hay Bale Challenge was launched and many entries in the first two years came from the York community, and across the wheatbelt, as well as the Perth metropolitan area and interstate. In 2017, Japan’s giant Wara Art sculptures caught the eye of The York Festival organisers. Founded in Niigata Prefecture, Wara (rice straw) Art responded to the need to find a creative use for surplus rice straw that had traditionally been used to make tatami mats and other utilitarian items. 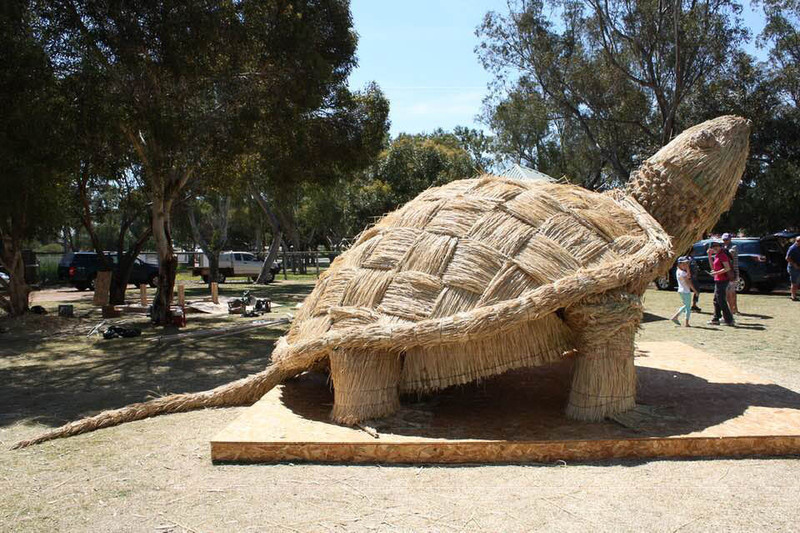 Professor Shingo Miyajima from the Science of Design Department at Musashino University, conceived the idea of using rice straw to create giant sculptures. 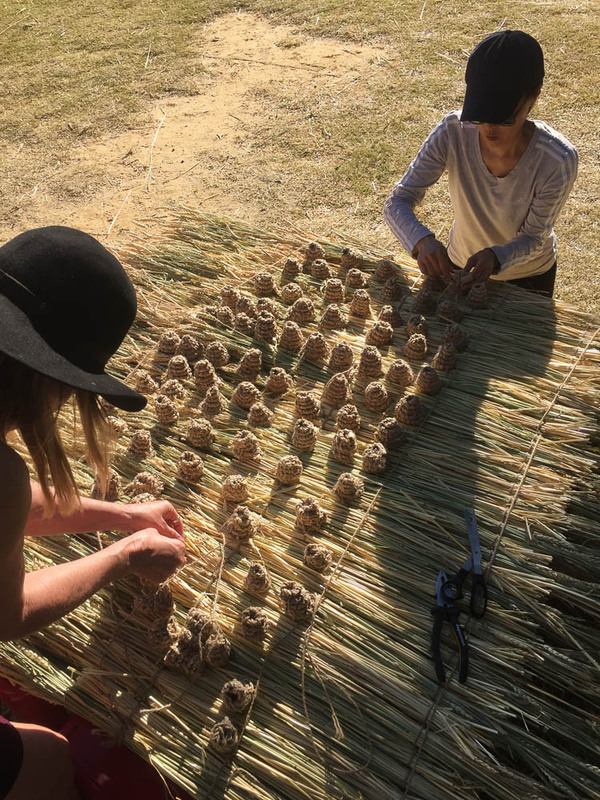 Since 2007, volunteers from local communities have been working together each year to create sculptures up to nine metres high for the annual Wara Art Festivals that take place across Japan. When Wara Art Japan accepted the invitation to send master Wara artist, Akira Moriya to York, the idea of creating Wara Art sculptures for The 2018 York Festival began to take shape. The first hurdle was sourcing the straw. Rice straw is unavailable in Western Australia, so the obvious alternative was wheat straw. 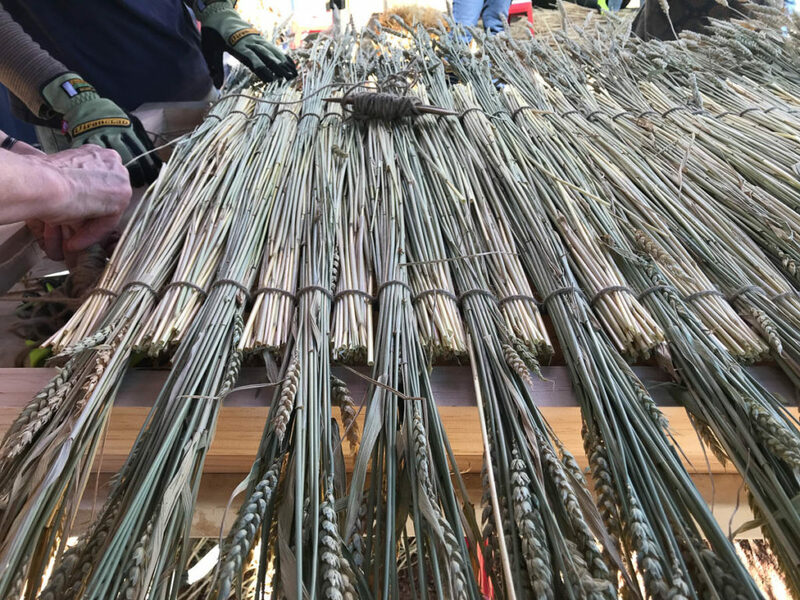 However, wheat is usually harvested into bales, which was unsuitable for this project. 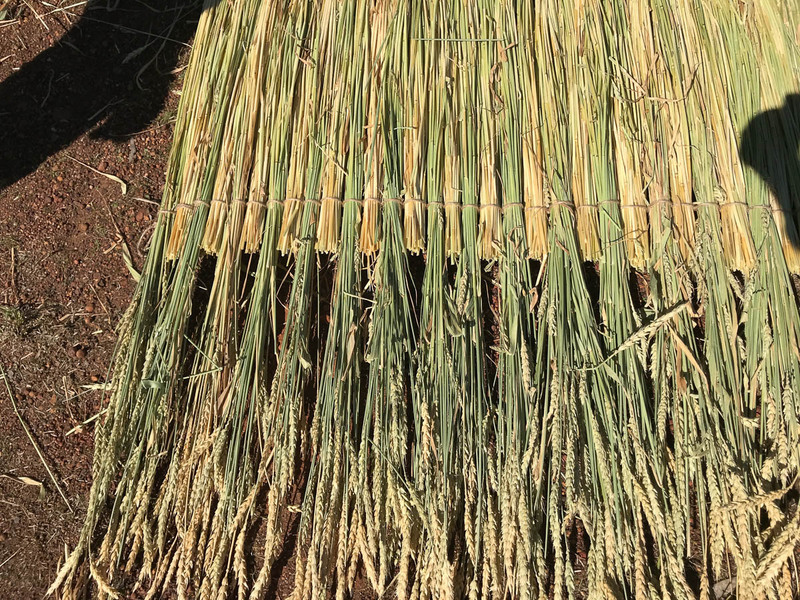 A stroke of luck was finding one of the few farmers in Western Australia who still harvests wheat in stooks (used for chaff). Luckier still, this farmer was located just 20kms from York. Three tonnes of the 2017 wheat harvest from this special supplier was stored in an airtight sea container, keeping it fresh and sweet until it was required in the spring of 2018. In Japan, the main aim of Wara Art is to bring people together—providing the opportunity for people to connect with others, problem solve, share skills and stories while performing the various tasks required to achieve an impressive and expressive outcome. The subject and design of the finished sculptures are secondary to the process and interaction that takes place during their construction. York’s Wara Art project was expected to attract mainly people interested in fibre and sculpture. Instead, over 150 volunteers from all walks of life stepped up. 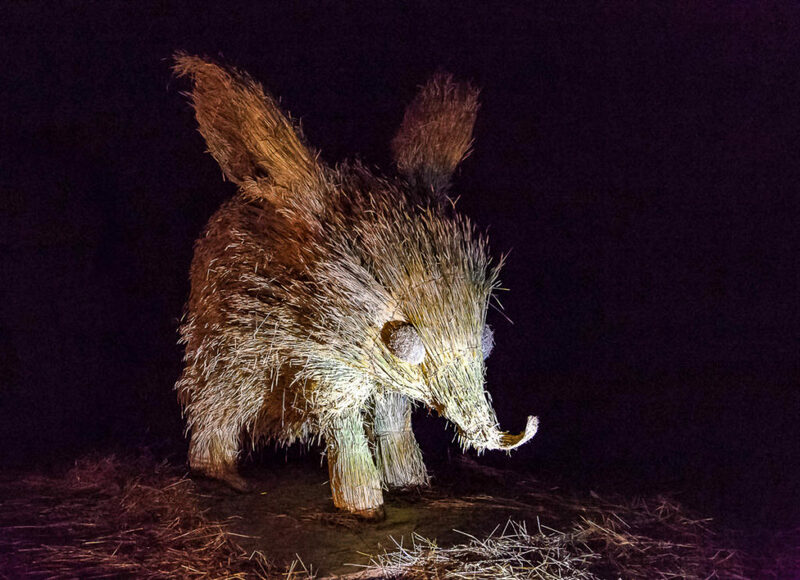 An estimated 1300 volunteer hours were spent constructing the three sculptures of endangered Australian fauna. Remarkably, around 20% came from within the York community, overcoming the ambivalence and healthy scepticism, typical of many rural Australian towns. 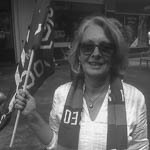 Others travelled from Katoomba in New South Wales, the Perth metropolitan area, Albany, Esperance, Manjimup, Nannup and Dwellingup in the South-west of Western Australia. 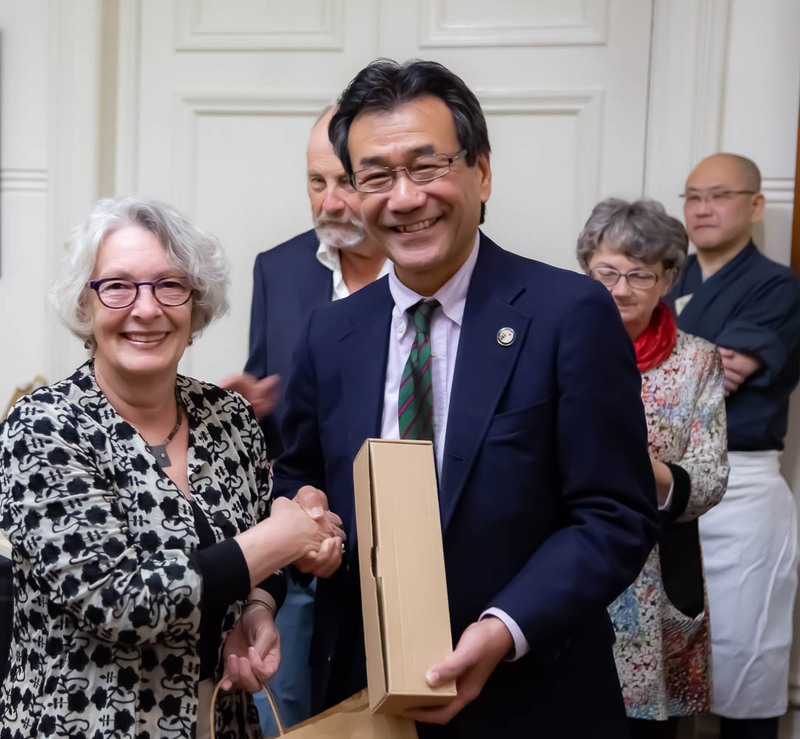 The Japanese community, enthusiastically led by the Japanese Consul-General in Perth, Tatsuo Hirayama, his wife, chef and other staff made repeated trips to York to participate, encourage the team and deliver delicious Japanese treats. 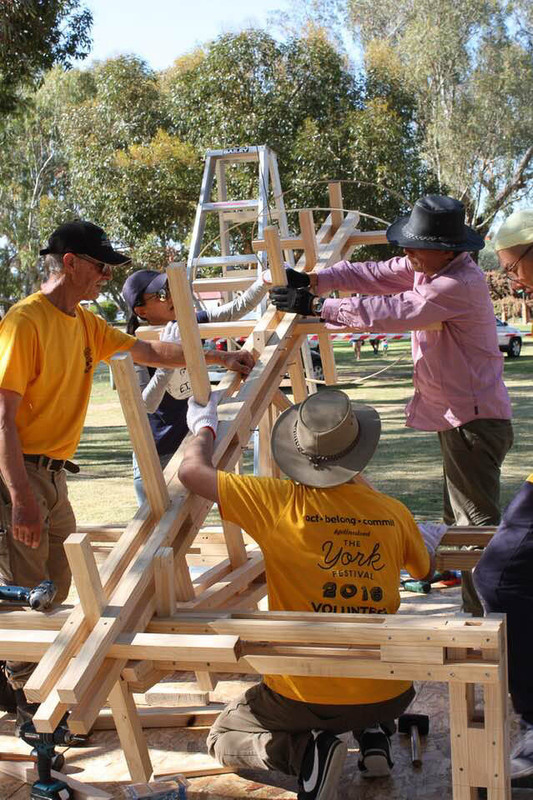 The project offered a unique opportunity to learn new skills from Wara master Akira Moriya, and Perth sculptors Fiona Gavino and Yuko Takahashi. Hand-made steel needles were forged by one volunteer, as well as simple hand-crafted bamboo needles. A bamboo splitter, machetes and other tools were sent from Japan. On his arrival in York, Akira immediately inspected the wheat straw that had been stored since the 2017 harvest. With the wheat heads still attached to the stalk, Akira could see possibilities for the textures these would give the sculptures’ final form. The volunteers’ first task was to make four 1x2m wooden frames needed for weaving the toba that would form the sculptures’ outer covering. Then we needed to prepare the straw. Terms were invented for the method of cleaning the flags from the wheat stalks: unflagging, puffing and stripping were referenced with mirth. Bundles of wheat stalks were laid onto the wooden frames and stitched with jute string to create the toba. Toba-making continued throughout the entire project, around 200 in all. Splitting bamboo and cutting timbers for the armature came next. Akira arrived from Japan with designs for a Bilby, Western Swamp Tortoise and White Bellied Frog drawn onto graph paper and maquettes (small wooden models) that showed the individual lengths of wood needed for the armature. The detailed designs, maquette and mathematical calculations were essential communication devices used to bridge the language barriers between the English and Japanese speakers. 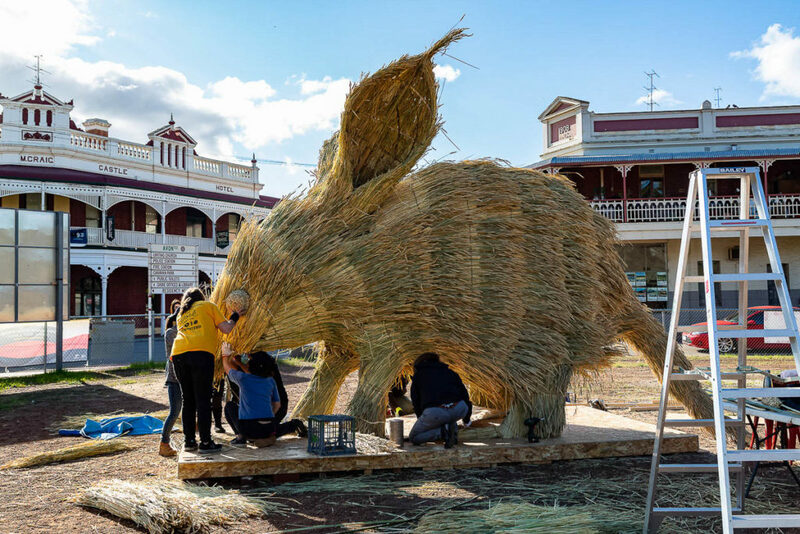 As the Bilby’s armature began to take shape on York’s main thoroughfare, people began to stop and ask questions “what is it?”, “what strain of wheat straw are you using?” and “are you gonna burn it after?”. It was exciting to finally see the scale of the sculpture. The Bilby was finished and work started immediately on the Western Swamp Tortoise. Time was marching on and momentum was required to engage more volunteers from the local community. Callouts for volunteers were made via social media, the local community radio station, the pub, shops and cafes. The response was heartwarming as volunteers fronted up to help complete the Tortoise and start on the Frog. The town collectively and individually took ownership of the creatures. Local kids on bikes shouted out comments on their way home from school and grannies on scooters cruised by daily to see progress. Regular deliveries of soup, freshly baked scones, cakes and biscuits helped to keep the volunteers well-nourished. Many called by just to watch the activities—not just once or twice but daily, week after week. 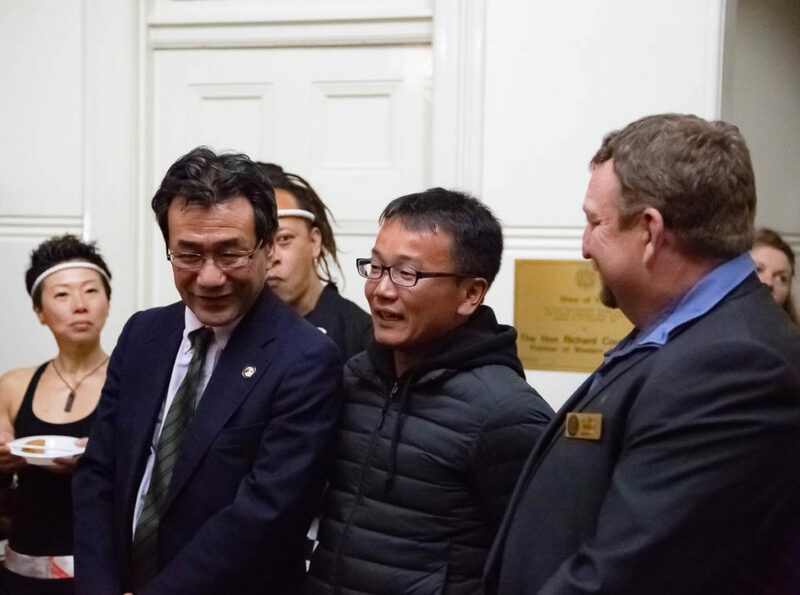 An address by Akira, Yuko Takahashi and project coordinator Ilsa Bennion to the York High School assembly resulted in a group of 10 – 13-year-old art students undertaking an excursion to see the sculptures, designs and maquettes and the workers in action. So what is the impact of Wara art on York? WA’s first inland town celebrated its agricultural roots through a unique public art project, making a cultural statement and creating networks and connections at home, across Australia and Japan. The subject matter raised awareness of WA endangered animals impacted by habitat destruction and feral predators. The material used highlights WA’s wheat exports to Japan. The ~50,000 visitors to York for the month-long festival generated a $3million economic boost for the town. These tangible achievements can be readily checked off. Community concerns that the sculptures would be vandalised have so far been unwarranted. The straw sculptures are ephemeral. In Japan, the Wara Art sculptures are literally fed to the goats. In York, the lasting legacy of Wara Art is sharing and community pride: sharing skills, experience and ideas. There is pride at having contributed to a unique public art event that has attracted so much attention. A lot of talking goes on while peoples’ hands are busy and the sweetest moments were hearing the conversations between volunteers from different walks of life sharing family history, connections to the wheat, Japanese culture and rural Australia. The York community has indeed been re-invigorated by straw. Wara Art Japan plans to co-host the inaugural International Wara Art Summit in York Western Australia, in spring in 2019. The York Festival’s Wara Art project was made possible through funding from Festivals Australia, the Australia-Japan Foundation, the Department of Local Government and Cultural Industries, the Shire of York and Healthway’s Act-Belong-Commit program. Jenny Garroun spent 25 years in documentary and film production. She founded The York Festival as an art & craft market in 2014. In 2016 she and her husband restored a 1870s building in York and after completing reinstatement of its original facade, opened a new contemporary gallery, gallery shop and cafe in early 2017. The accompanying accommodation quarters enables the gallery facilities can support residential workshops/retreats for artists, writers and other cultural pursuits. Jenny was guest speaker at the 2018 Wara Art Summit in Minokamo, Gifu in Japan on 30 November 2018. 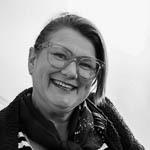 Perth based Ilsa Bennion has a background as an educator in the Visual Arts, which has led her to develop a career working as Project Officer with the Department of Culture & Arts (2008-2010) and Education and Public Programs Officer at Art on the Move (2010-2018). In these roles, she has used her skills to plan and implement public programs for touring exhibitions, research and write educational support material for exhibitions, liaise with artists, curators and venues in the coordination of events, plan and write itineraries for artists and curators and deliver professional learning for teachers. She is a skilled communicator, highly resourceful and collegial in her approach and in dealing with key stakeholders, including students, educators, artists and the public. ✿ How did you decide to become a wara artist? I was involved beyond generations of straw art and I was interested in enjoyable places. In the past, objects made of straw, such as sandals, were a familiar presence in Japan, but now there is almost no opportunity to make contact with this material. It is a rare case that you can see the happiness of children by making good use of grandparents and grandmothers. I am thinking that such circle will spread and I am continuing activities. ✿ Is this your fulltime occupation in Japan? No. Throughout the year, it is difficult to make a living by making straw art only, other business is the main. ✿ How do you choose your designs? It is a request from the York Festival that we want you to produce endangered species of Western Australia such as Bilbae, Turtle and Frog. ✿ What was it like working in York compared to Japan? In Japan, we use rice straw. This time I used the wheat straw, but it was hard to express the curve because the part of the stem was hard. Regional people and other people involved in volunteering are not as different as we had anticipated, rather I think that women are more active than Japan. ✿ How would you like wara art to develop? Although it is the second time to work outside of Japan, I hope to expand the range of activities globally in the future, feedback this to Japan and throw it back to the world. I hope to make use of resources such as shells and waste materials, other than straw, to develop various models.